This contribution provides a comprehensive overview on the theoretical framework of aggregating fuzzy relations under the premise of preserving underlying transitivity conditions. As such it discusses the related property of dominance of aggregation operators. After a thorough introduction of all necessary and basic properties of aggregation operators, in particular dominance, the close relationship between aggregating fuzzy relations and dominance is shown. Further, principles of building dominating aggregation operators as well as classes of aggregation operators dominating one of the basic t-norms are addressed. 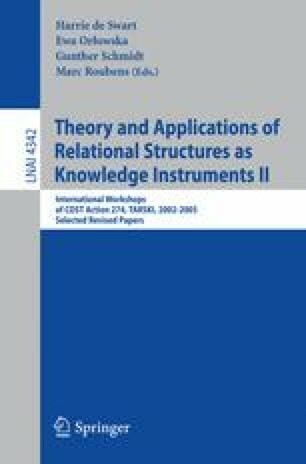 In the paper by Bodenhofer, Küng and Saminger, also in this volume, the interested reader finds an elaborated (real world) example, i.e., an application of the herein contained theoretical framework.